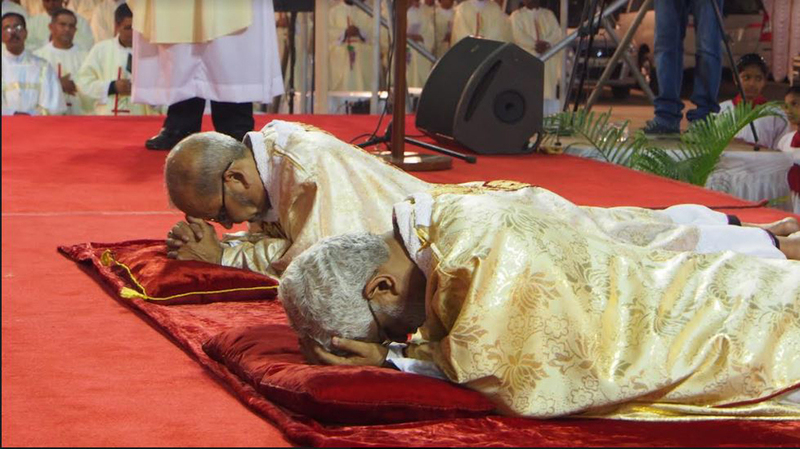 Fr Allwyn D’Silva and Fr Barthol Barretto said “I do” to ten questions before being ordained auxiliary bishop by the archbishop of Bombay Oswald Cardinal Gracias. 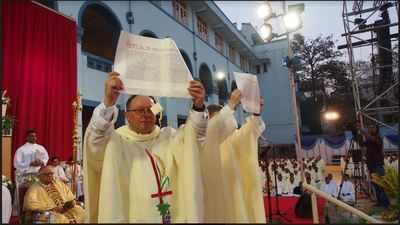 MUMBAI: Approximately 10,000 Catholics assembled in the grounds of Don Bosco School, Matunga, Saturday evening to watch two priests take a very special vow. 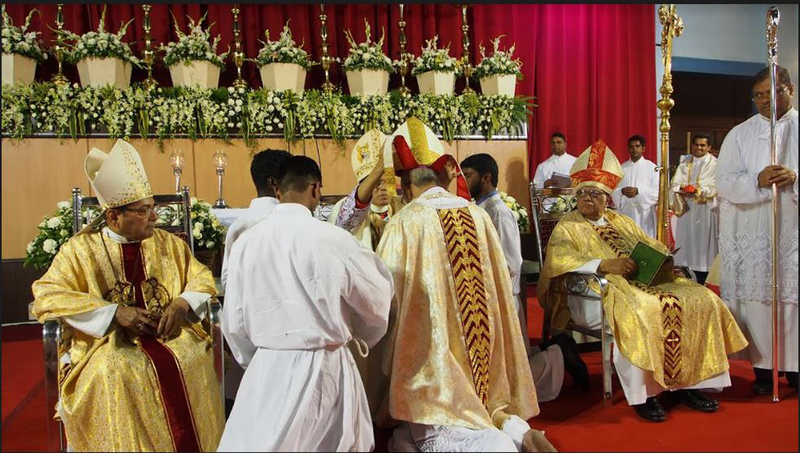 Fr Allwyn D’Silva and Fr Barthol Barretto said “I do” to ten questions before being ordained auxiliary bishop by the archbishop of Bombay Oswald Cardinal Gracias. “The gospel was placed above our heads, and we received the bishop’s ring, mitre (cap) and staff which symbolises the shepherd herding his flock,” Fr Allwyn said. The appointments were announced by Pope Francis December 20. Both Fr Allwyn and Fr Barthol are grassroots workers who have earned the respect and love of their people. Both will continue to serve their respective parishes at St John the Baptist Church, Thane, and Our Lady of Immaculate Conception, Borivli, until May 31. Fr Allwyn with 21 years of work in Mumbai’s slums is a champion of environmental causes. He is secretary of the FABC Climate Change Desk. His chosen motto is ‘Care for Creation’. His parishioners hired 12 buses to reach the venue Saturday. Parishioners of I C Church and neighbouring localities led a caravan of 19 buses to cheer Fr Barthol Barretto. Born September 16, 1961, Fr Barthol studied at St Michael’s School, Mahim, and went on to graduate in history. Those who are Culprits, are been rewarded “LordShip” Title, because the Diocese have no choice, for they have to run their shop of BULLING in the name of Religion. Bishop Allwyn D’silva, Champion of Environmental Causes. His Chosen motto is Care for Creation as it has been said about him . Ignore Humans and Care for Creation that should be his appropriate motto for him. Cause while he was in Bhayander parish he has not contributed positively, Only created wider divide between two communities, and invited trouble on Maundy Thursday, where even the Commission appointed by the Arch Bishop admitted in its report, “that if the Parish Priest wanted he could have avoided the situation”, by discussing the issue with the Parishioners. But he dint find it necessary, because he was busy with Environment. The Learned Parish Priest instead of calling the Parishioners for a Peace after the episode, Preferred to Lodge a Police complains against the Parishioners with a tile of the Complain. “The War is over the Battle has Started”. With Such wisdom of the Parish priest, The Title of the Lordship has been conferred upon him. As I said it before He is an also accused of 3 Land deals where in documented corruption has been highlighted and the Charity commissioner has issued a Show Cause notice to him in the year 2016. Where in as a Trustee he has issued a NOC to a Builder related the Church Plot, which is under the Church possession since 1955, He states in the NOC that the Plot does not belong to the Church and the Builder is free to construct upon it. 11-story building is standing over it without a penny to the Church. In another deal the Builder had defaulted payment to the church for 2.3 Crores for 3 years and in a sale Plot , and the church could have cancelled the deal and take charge of the plot. However, before leaving the Parish he accepted Cheque of 25 lacsfrom the builder, which made the builder again eligible in the legal process. Moreover, till date it has been more then 5 years now the Builder has not paid any amount to the Church. And the Builder still claims the plot. The 3rd deal where the Church made losses of more than 2 Crore rupees cause the plot worth 2.5 crore rupees was sold for 55 lacs only. There have been immense losses made by Fr Allywn D’silva to the Parish of Bhayander in tune of approx 5 crore rupees , and all the above subject matters are made aware to the Arch Bishop but still, He was best suited for the Lordship Cap , after all the corruptions and misdeeds done by him. And most of the Parishioners are either innocent or have shot term memory and try to forget this sort of deals cause when the Parish Priest Changes the parishes he starts with a new leaf to write a new story. Moreover, old mess has been forgotten. And the Arch Diocese without applying it mind presents you a corrupt priest as Lordship to you and we have to accept it blindly because we do not questioned its appointment. I challenge and Questioned the Authority of the Arch bishop to give me the Answers of the above messed up deals , and prove me wrong , But I guarantee you they would not even move from the seat “ Cause they don’t care at all” about the parishioners or the church. NOVENA TIMINGS AT ST. MICHAEL’S CHURCH, MAHIM. Follow Us to Receive Mail & Hear the Truth on Corrupt practices in your Parish & Archdiocese. Enter your email address to follow our blog and receive breaking news of your parish and archdiocese by email.